From the I'd rather see BGirls on all fours... nekkid department... You knew it was coming and now it's here... my boi Romeo Navarro celebrates A Decade In Action with BBoy City 15 (hmm... 10 == 15) @ The Parish from April 24th - 27th! Congrats Romeo! and we better pull Ernesto out this time! 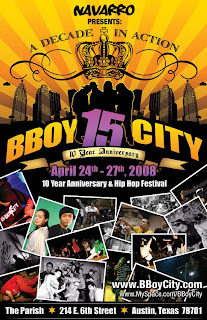 BBoy City is the biggest and baddest Hip Hop festival in the Capital City. You better not miss it!